It's well known that social signals are a ranking factor in the Google SERPs. Meaning having them on your website helps it to rank higher online. 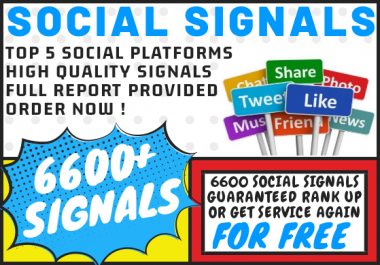 So to help with that and improve your ranking positions in Google we present, offer and provide 6600 permanent high quality authority based social signals! There are many services online and in the marketplace here for social signals? What makes our signals service different from others? We only use the Top 5 social media sites. We only use our own old aged accounts. 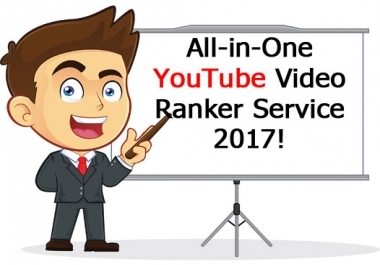 We do great rank improving SEO! We create posts and bookmarks onto Pages, Groups & Boards etc that are RELEVANT to YOUR unique site. This is MUCH better for your SEO / signals relevancy than random posts on new or dummy accounts like some sellers do. We believe social signals always help to improve rankings in the SERPs. And will guarantee they do after 30 days or give you the service again for free! What we do and what you get. We will build approximately 6600 mixed social signals to your website. This will be in the form of top social media site likes and shares/reshares etc added directly to your website URL. As well as posts and bookmarks, tweets & pins etc. All with extra shares/reshares, retweets, repins etc etc added to them. We'll check your current signals count before starting work for you. And we'll send you a full report when we're completed with everything. We'll process your order within about 7 days time for the standard 6600 amount. Possibly longer of course if you order with extras. And we have some awesome extras! What Signals do we build to where and why? How many signals do we build/add? Approximately 6600 in the standard service but we usually over deliver for good measure sake! We can build unlimited more signals in our extras! How many actual bookmarks do we make? For the standard 6600 service about 10. Then basically doubled for every other amount you order with any extras like 20, 40, 80 etc. All mostly powered by extra shares etc signals! How long does it take to complete everything? For the standard service we aim to have it done (drip feed style) within 5-7 days time. We will need more time if you order with extra amounts obviously. How many URLs can I use in the standard service? We accept just 1 URL for the standard default 6600 amount and service. You can use more URLs if you order with more extras 1 URL for every extra amount ordered. Which social media sites do we use? We use the best of the best and none of the rest! 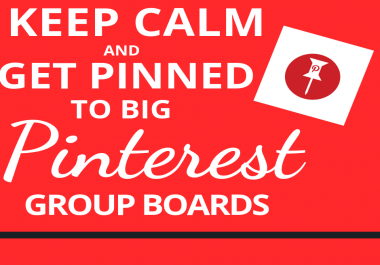 Facebook, Twitter, Pinterest, Google+, Bitly, Buffer, Reddit, Tumblr & a few more which we bookmark too. Why are the signals relevant how does it matter? Most sellers just create bookmarks using new dummy disposable accounts they post to and don't post/bookmark to places that are relevant to your site. We do which makes much more sense and is much more rewarding all round for you! We believe that our signals will have a positive ranking effect on your URL/webpage in the Google SERPs after 30 days after completing it, if it doesn't we'll provide you with the service again for free. How many sellers do that? Try not to overthink it! But just reach out to us and send me a direct message. Price: Just $9 on its own. Just place your order now and send me your URLs to use.